As we build a series of podcasts (taped telephone interviews) with estate planning experts, today we are looking some of the issues around record keeping. For the purposes of this podcast, what is estate planning? 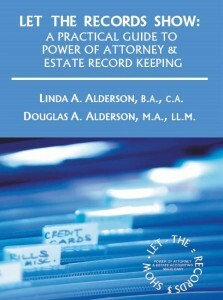 What does record keeping have to do with estate planning and why is it such a key component? On a practical level, is there one aspect that is the most important about record keeping when it comes to estate planning? What are the biggest “don’ts” regarding estate planning and record keeping? How do I know that my estate plan is “working”? Every family needs to understand the importance of record keeping. Please take a moment to benefit from Linda’s expertise, wisdom and experience.